and the hedge, and that old tree out front. that tree surprises you with the most incredible spring blossoms. And come summer, you realize . . .
growing in your very own front yard. That’s when life is pretty effing awesome. Awesome. Add it to the list of things that make you happy! That’s amazing, wow I think I would die and go to heaven if that happened to me. Nice! I had a similar-ish discovery just yesterday when I found out a raspberry bush, with ripe berries, is growing in the corner of the yard. Although that corner didn’t benefit from any particular work of mine :). @ sarah – I would adore it if you sent your recipe! I was thinking a cherry pie, but a cobbler sounds even better! 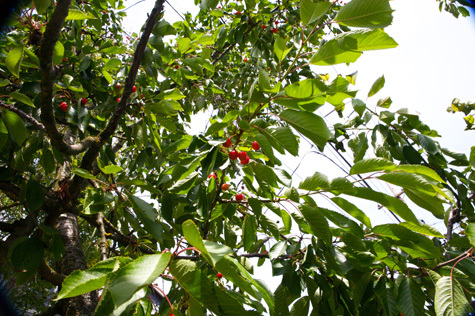 Do you pit your own cherries? What kind of tool do you use? @ Libby – Totally! Thanks for the reminder, m’ dear. @ Charley – Seriously, I could not believe it. 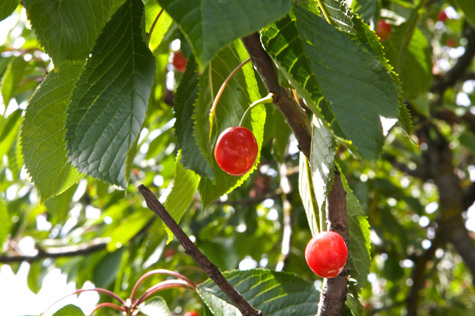 Cherries are one of my husband’s absolute favorites, and I love them as well. 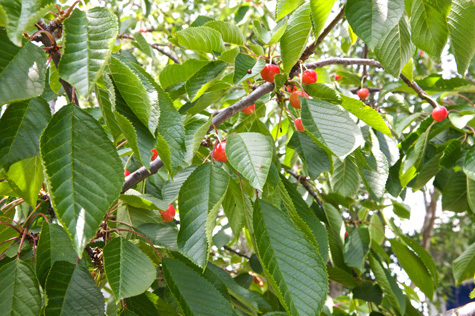 I’m from SoCal so even the idea that one can *have* a cherry tree, is like, mind blowing to me! 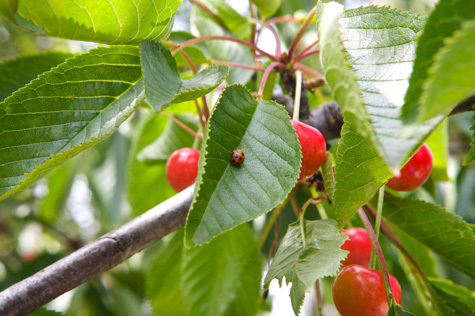 pit the cherries as you pick them… when they are perfectly ripe, if you squeeze them slightly as you pick them often the pit will stay on the stem – which is amazing! if the pit is still in the cherry though, just squeeze it and “shoot” the pit right out, THEN throw it (flesh only) in the bucket. it’s sticky but it’s fun. and saves so much time because then all you have to do is rinse them well. i have four cups or so, pitted, rinsed, and in the freezer for later use from our tree right now. Well, there’s something for a nice morning. There’s a tree called Reina De Las Flores (Queen Of The Flowers) in my grandmother’s house and on my Univ. Campus and it’s blooming season. It really is a sight to see, since the flowers are bright purple, but dark enough to stand out, and the leaves are a pleasant green. 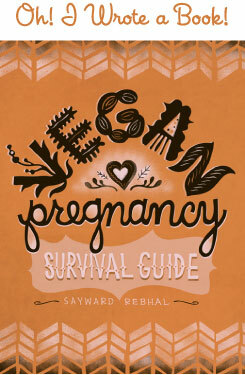 @ sarah – Ooh, thanks for the tips! @ Mr. Man – Reminds me of the Jacaranda trees that lined the streets in my home town. They bloomed bright purple and the blossoms just covered the trees. So gorgeous! Word! I love your site and your energy/manifestation. Good stuff. Seems you figured out you have a pie cherry, hard to find in the marketplace, so doubly good for you if you like to bake and want the real deal! Something I’ve been wanting to ask/suggest, have you heard of terra preta? If not google it or go to http://www.css.cornell.edu/faculty/lehmann/index.html, or: http://www.museu-goeldi.br/pesquisa/ecologia/tpa/paginas_imagens/tpaindex.htm, or: http://www.geo.uni-bayreuth.de/bodenkunde/terra_preta/index.html, or:http://www.eprida.com/, or: http://www.bbc.co.uk/science/horizon/2002/eldorado.shtml. I know that’s a lot but at least take a look, I think someone of your vision would be greatly inspired and rewarded for taking the time. Zefiro! I’m glad you like the site, welcome! @ Jenny B. – Thanks! HA! How did I miss this post last year? Weird. Gave me goose bumps just reading it though….So freakin’ cool! !